Arizona retail food prices at the supermarket are up in the second quarter of 2015, according to the latest Arizona Farm Bureau Federation Marketbasket Survey. The informal survey shows the total cost of 16 basic grocery items was $50.88, up $.59 or about 1 percent more than the first quarter of 2015. Compared to Arizona’s July 2014 survey total of $52.64, the 2015 first quarter Marketbasket survey shows that Arizona’s food prices have decreased about 3 percent year-to-year. Of the 16 items surveyed in Arizona, seven decreased, nine increased compared to the 2015 first quarter survey. In Arizona, off-the-shelf prices for sirloin roast showed the greatest decrease in price down 60 cents to $5.98 a pound; salad mix down 55 cents to $2.40 a pound bag; chicken breast down 24 cents to $3.12 a pound; apples down 20 cents to $ 1.25 a pound; ground chuck down 10 cents to $4.15 a pound; shredded cheese down 5 cents to $5.14 a pound; and potatoes down 1 cent to $2.68 a 5-pound bag. Eggs showed the largest price increase up $1.12 cents to $3.23 a dozen. The other items that increased in price were deli ham up 46 cents to $3.92 a pound; vegetable oil up 34 cents to $2.12 for the 32-oz bottle; milk up 16 cents to $2.97 a gallon; white bread up 9 cents to $ 1.20 a 20-oz loaf; toasted cereal up 8 cents to $3.21 for the 8.9-oz box; orange juice up 6 cents to $ 3.02 a half gallon; bacon up 2 cents to $4.48 a pound; and flour up 1 cent to $2.01 a 5-pound bag. The year-to-year direction of the Marketbasket survey tracks with the federal government’s Consumer Price Index report for food at home. “In the mid-1970s, farmers received about one-third of consumer retail food expenditures for food eaten at home and away from home, on average. That figure has decreased steadily and is now just 16 percent, according to the United States Department of Agriculture’s revised Food Dollar Series Department statistics,” explains John Anderson, American Farm Bureau Economist. The USDA’s new Food Dollar Series may be found online at http://www.ers.usda.gov/FoodDollar/app/. Using the “food at home and away from home” percentage across-the-board, the Arizona farmer’s share of this quarter’s $50.88 Marketbasket total would be $8.16. The Farm Bureau Market Basket Survey is unscientific, but serves as a gauge of actual price trends across the state. Arizona’s bargain shoppers statewide should find individual items at prices comparable to the Farm Bureau survey averages and certainly cheaper with discounts and in-store specials. Arizona Farm Bureau seeks to identify the best in-store price, excluding promotional coupons and special deals. ** National will only conduct two quarterly surveys on these items. Sort your pantry and organize to clearly know what’s available. This should be a regular effort in order to make sure you’re using everything you have, not buying unnecessary items and can determine what you really need. Create a week-long menu. From the planned menu create your shopping list based on local grocery store circulars you receive in the mail or newspaper. When planning your menu, think of ways to maximize the use of the “Stretch Your Food Dollar” menu as a springboard to create your own menu. Gather ideas for meals based on the items down in price from Arizona Farm Bureau’s “Stretch Your Dollar” menus onfillyourplate.org. Let the Farm Bureau’s menus inspire your creativity! You’ve created the list; stick to it. If you can stick to your list, you’ll curb impulse spending on items you don’t really need. Don’t shop on an empty stomach. 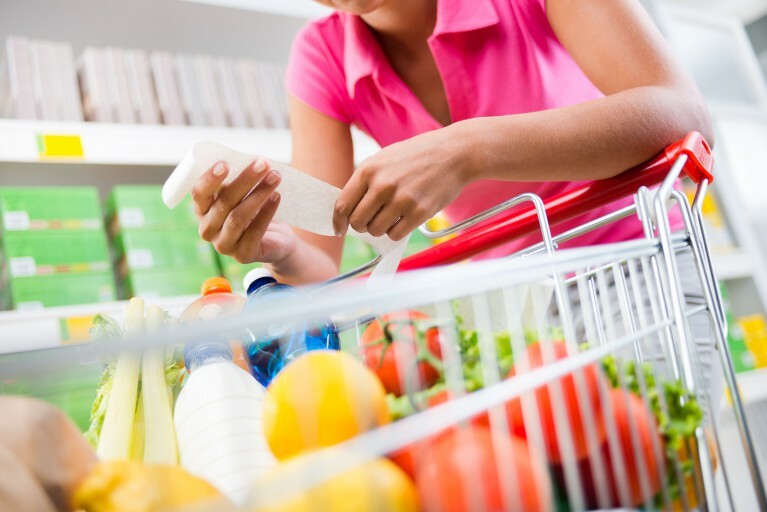 Studies suggest you might spend 10 to 15 percent more on your food bill when you’re hungry. Don’t take the kids grocery shopping. As with an empty stomach, kids can influence your impulse shopping. Stick to the basics. While basic food items like dairy, meat, fruits and vegetables can sometimes seem expensive, you’re gaining more value per unit and certainly more health benefits. The fewer processed food items you purchase, the more you’ll save. Regularly survey the weekly grocery store circulars. This will build your knowledge of prices for products you regularly use and give you a sense of which grocery stores tend to have the lowest prices. Take advantage of weekly advertised specials, especially for nonperishable staples. Be wary of the coupon trap. Use coupons only for those items you normally buy. Don’t let coupons cost you money by buying items you don’t really need. A sale has no value to you if it means you’re spending beyond your budget. Do take advantage of “ad-matching” since lots of savings can be found here. Assess the unit price. This shopping tool lets you compare prices between brands and between sizes. Located on a shelf tag in front of the product, it provides costs in like units for the item. Generally, information is given in cost per ounce, per pound or per count. Shop the edges of the store, and if items at the ends of the aisles reflect a super deal buy. As aisle-end items are dramatically marked down, they might be a valuable substitute on your grocery list. But they’re budget busters if they become purchased food items you don’t use in your food preparation. Use grocery store club cards; also compare prices to store brands. Store club cards can generate great savings. Plus, while you might love a certain brand, also compare a popular brand to the store brand for price comparisons and possible savings. When not buying fresh, consider buying frozen. Most frozen vegetables are picked fresh, immediately flash frozen, are less expensive and will keep longer. Buy in bulk, but don’t buy more than you will use. Bigger is not always better. Larger-sized packages usually cost less on a per-unit basis. But it’s not a better buy if it’s too large to use before it becomes stale or spoiled. Move in on “family pack” savings. Meat departments often have a section that offers larger-sized packages at cents-off-per-pound savings. Repackage these larger sizes into smaller quantities at home and freeze. Be flexible at the meat and produce counters. This is one area to be flexible with your list. This allows you to take advantage of unadvertised “in store” specials and switch from one item to another. Use open dating codes, especially on perishables to maximize shelf life at home. Open dating is used on perishable and semi-perishable products to let you know at a glance if the product is fresh. Most stores use a “pull date” – the last day the item is offered for sale. This still allows a few days for using at home. For stores that use a “pack date,” especially with meats, inquire how long the product will remain fresh at home. Arizona Farm Bureau began a quarterly Market Basket starting the fourth quarter of 2006. The Arizona Farm Bureau is a grassroots organization dedicated to preserving and improving the Agriculture industry through member involvement in education, political activities, programs and services. Go to www.azfb.org to learn more. To obtain “Stretch Your Food Dollar” menu and nutrition information go to www.fillyourplate.org. As a member services organization, individuals can become a member by contacting the Farm Bureau. For information on member benefits call 480.635.3609. This entry was posted in Arizona Food Prices and tagged Fill Your Plate, food, Grocery store, local food. Bookmark the permalink.